an·ti·so·cial [àntee s?sh’l, ànt? s?sh’l] adjective 1. not sociable: preferring not to spend time with other people 2. not conforming to accepted behavioral standards: hostile or indifferent to the comfort or needs of other members of a community or society as a whole -an·ti·so·cial·ly [ànt? 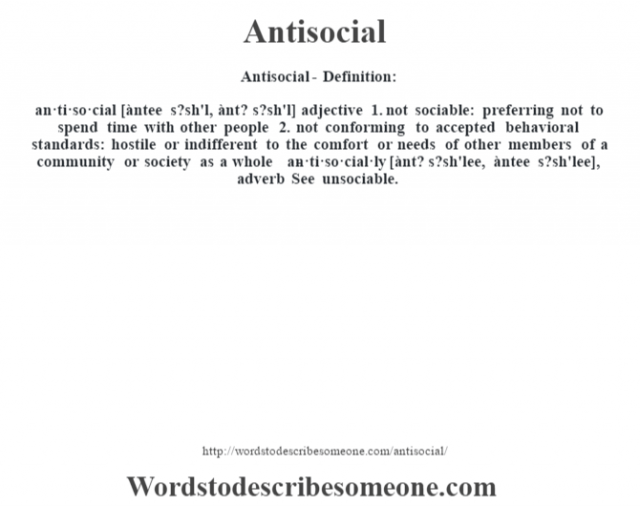 s?sh’lee, àntee s?sh’lee], adverb See unsociable.